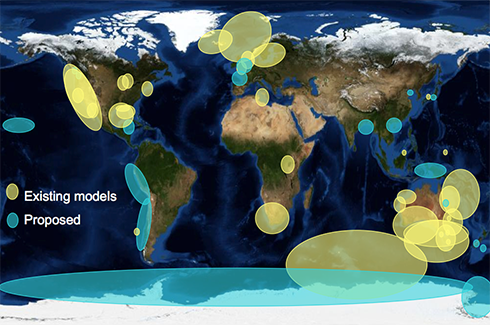 Atlantis has been used in 30+ systems round the world, from small estuaries to large ocean regions (Figure 1). Many of the models have been in temperate marine ecosystems, but there are also models for polar regions, tropical reefs and even lakes. Figure 1: Systems where Atlantis is in use or under development (yellow) or proposed (blue). The modelling approach has primarily been used to address fisheries management questions (e.g. appropriate strategic management options for regional fisheries), but is increasingly being used to consider other facets of how marine systems function or are used.